Received June 20, 2018; Revised August 12, 2018; Accepted August 14, 2018. Regardless of the importance of a viral pathogen, citrus tristeza virus (CTV), in citrus industry, molecular marker tools closely associated with its resistance trait have not been developed yet. Map-based cloning of a Ctv locus, one of at least two CTV-resistant loci, was previously reported from trifoliate orange. The genetic locus displayed a distinct feature of enriched composition of R genes that encode coiled-coil-nucleotide-binding site-leucine-rich repeat (CC-NBS-LRR) receptors. Based on the previous molecular characteristics of the genetic locus, we developed multiplex PCR marker sets to specifically detect seven R genes consisting of a Ctv locus. By using the multiplex PCR marker sets, we determined composition of seven R genes consisting of the genetic locus in a total of 155 citrus genetic resources including 12 of Korean landrace citrus. Genetic composition of seven R genes in the locus was variable among the genetic resources investigated. However, all of seven R genes were detected only in both trifoliate orange, Poncirus trifoliata and its derivative cultivar, P. trifoliata ‘Flying Dragon’, which have been reported to be resistant to CTV. Multiplex PCR marker sets established in this study would be an effective molecular tool to develop scion or rootstock cultivars with high resistance trait against CTV in citrus breeding program. Citrus tristeza virus (CTV) is the most significant pathogenic virus in citrus worldwide, which causes two major serious disease syndromes, that is, quick decline and stem-pitting. The former causes tree death resulting from phloem necrosis below the graft union of infected scions on sour orange (Citrus aurantium L.) rootstock. The latter decreases tree vigor, fruit size and quality, and productivity regardless of rootstock (Gmitter et al. 2007). CTV has infected 100 million citrus trees, mainly in the Americas and Mediterranean (Donkersley et al. 2018). There are only three Citrus relatives which have been reported to be resistant to CTV; Severinia buxifolia (Poir.) Tenore, Swinglea glutinosa (Blanco) Merr., and Poncirus trifoliata (L.) Raf. (Garnsey et al. 1987; Garnsey et al. 1997; Mestre et al. 1997a). In the genus Citrus, some of C. maxima (Burm.) Merrill are known to have resistance to CTV. The CTV resistance gene was characterized as a single dominant gene (Yoshida 1985, 1993) and designated Ctv (Gmitter et al. 1996). Fang and Roose (1999) subsequently identified another single dominant gene (Ctv2) conferring CTV resistance from ‘Chandler’ pumello [C. maxima (Burm.) Merrill], which was an independently assorting gene from Ctv. For the map-based cloning (MBC) of Ctv gene, many molecular markers associated with CTV resistance have been developed from the bulked segregant analysis (BSA) for the genetic cross or backcross population using trifoliate orange (P. trifoliata); random amplified polymorphic DNA (RAPD), inter simple sequence repeat (ISSR), sequence characterized amplified regions (SCAR), and restriction fragment length polymorphism (RFLP). Many efforts have been further focused on the construction of genetic linkage maps for the CTV resistance locus and marker-assisted selection (MAS) by using the developed molecular markers (Gmitter et al. 1996; Deng et al. 1997; Mestre et al. 1997b; Fang et al. 1998). Bacterial artificial chromosome (BAC) libraries were constructed for MBC of Ctv gene (Deng et al. 2001a; Yang et al. 2001). BAC contig map covering Ctv locus was constructed from chromosome walking using molecular markers closely linked to Ctv and BAC clone searches by resistance gene candidate (RGC) markers (Deng et al. 2001b; Yang et al. 2001). Finally, Yang et al. (2003) determined nucleotide sequences of 282 kb of BAC contigs covering Ctv region and performed gene prediction. They found that the contig contained R gene cluster consisted of seven coiled-coil-nucleotide-binding site-leucine-rich repeat (CC-NBS-LRR) genes and suggested that one of the R genes may be a Ctv gene conferring broad spectrum resistance against CTV. Two BAC contig sequences containing either resistant (Ctv) or susceptible allele (ctv) were isolated from BAC libraries of ‘Thong Dee’ pumello (C. grandis L.) and CTV-resistant USDA 17–47 line (‘Thong Dee’ pumello x P. trifoliata). Comparison between Ctv and ctv contig sequences revealed that two CC-NBS-LRR genes, R2 and R3, were found only in the contig sequence containing resistant allele, indicating that these two R genes could be strong Ctv candidates (US patent No. 7126044B2). Rai (2006) introduced ten Ctv resistance candidates including R genes into CTV-susceptible grapefruit variety, C. paradisi, by Agrobacterium-mediated transformation approach. Transgenic lines displayed either an absence of initiation of infection or its slow spread (R2 lines), or an initial appearance of infection and its subsequent obliteration (R1 and R4 lines). These previous findings suggest that four R genes (R1 through R4) might play major roles in CTV resistance. Asins et al. (2012) reported that the position of the major QTL for CTV resistance is conserved among C. grandis, C. aurantium, and P. trifoliata, and located on linkage group 4b. These previous results strongly suggest that R genes in Ctv locus could be useful gene markers for MAS in citrus breeding program. Regardless of the importance of CTV resistance trait in citrus industry, molecular breeding programs to produce CTV resistant cultivars have not been systematically operated due to the absence of robust molecular markers tightly linked to the agronomic traits (Kim et al. 2016). Up to now, systematic molecular surveys of a Ctv locus in citrus have not been performed yet, although molecular cloning and characterization of a Ctv locus have been reported (Yang et al. 2003; Rai 2006). In this report, in order to make early selection of CTV resistant cultivars possible, we developed molecular marker sets to efficiently detect whole R gene sets in a Ctv locus and comprehensively explored distribution of the CTV resistant locus in the genetic resources of citrus and its relatives. Citrus genetic resources of two public research institutes in Jeju, Korea, were used in this study; Agricultural Research and Extension Services, Jeju Special Self-Governing Province, and Citrus Research Institute, National Institute of Horticultural & Herbal Science, Rural Development Administration. Citrus leaf tissues were collected from the accessions growing in the experimental research plantation. The leaves were rinsed with running tap water and then were kept at −80°C until use. Genomic DNA was extracted from leaf tissues using Biomedic® Plant gDNA Extraction Kit (Biomedic Co., Ltd., Korea; www.ibiomedic.co.kr) according to the manufacturer’s protocol. DNA quantity and quality were determined using DeNovix DS-11+ Spectrophotometer (DeNovix, Wilmington, DE, USA) and agarose gel electrophoresis, respectively. Primers to specifically amplify seven R genes encoding CC-NBS-LRR receptors are listed in Table 1. The PCR mixtures included 1 μL of genomic DNA (10 ng/μL), each 0.5 μL of forward and reverse primers (each 10 pmol/μL), 5 μL of 2x HSTM Taq mix (Dongsheng Biotech., Guangzhou, China), and 3 μL of distilled water. PCR condition to amplify the individual R genes was as follows; 95°C, 5 minutes for initial denaturation, followed by 95°C for 30 seconds, 55°C for 30 seconds, 72°C for 1 minute (total 35 cycles) with 10 minutes of the final extension at 72°C. The amplified PCR products were separated on a 1% (w/v) agarose gel containing ethidium bromide. In order to perform multiplex PCR, primer sets were divided into two groups, groups A and B. Groups A and B were composed of 4 and 3 primer sets, respectively. The mixing ratio of each primer sets for two groups were as follows; for group A, 2 (R1/CTV#4 and R3/CTV#8): 1 (R2/CTV#7 and R5/CTV#17); for group B, 1.5 (R4/CTV#11): 2 (R6/CTV#18): 1 (R7/CTV#21). The PCR mixtures included 1 μL of genomic DNA (10 ng/μL), 4 μL of primer mixtures, 10 μL of 2x HSTM Taq mix (Dongsheng Biotech. ), and 5 μL of distilled water. Multiplex PCR condition was the same as described above. In order to develop DNA-based molecular markers specifically detecting a Ctv locus, we performed multiple nucleotide sequence alignment using genic sequences for seven R genes, which were obtained from a public database (GenBank accession No. AF506028; Poncirus trifoliata citrus tristeza virus resistance gene locus, complete sequence) (data not shown). Individual seven R genes were specifically detected by the designed PCR primer sets (Fig. 1A). Multiplex PCR system consisted of two primer sets was further developed for robust and efficient detection of seven R gene sets in a Ctv locus. Groups A and B primer sets were able to specifically and efficiently detect their corresponding 4 (R1/CTV#4, R2/CTV#7, R3/CTV#8, and R5/CTV#17) and 3 genes (R4/CTV#11, R6/CTV#18, and R7/CTV#21), respectively (Fig. 1B). We performed two independent multiplex PCRs to determine the composition of seven R genes consisting of a Ctv locus in 143 accessions belonging to the genetic resources of citrus and its relatives. Fig. 2 illustrates the multiplex PCR results of individual seven R genes in a Ctv locus from each two representative accessions of 14 citrus groups. Table 2 summarizes composition of seven R genes including four major R genes (R1 through R4) in 143 accessions belonging to 14 citrus groups of the genetic resources of citrus and its relatives. The multiplex PCR revealed that all of the genetic resources commonly contained R7 (CTV#21) gene. R2 (CTV#7) and R6 (CTV#18) genes were detected only in two accessions belonging to trifoliate orange group. R4 (CTV#11) gene was not present only in three accessions belonging to either grapefruit (C. paradisi ‘Golden Special’) or tangor (Citrus hybrid ‘Setoka’ and Citrus hybrid ‘Harumi’). All of accessions belonging to kumquat and lemon groups contained only 3 out of 7 R genes, which was the smallest number of R genes as compared to other groups. In case of lemon group, all of five accessions only contained R4 gene out of four major R genes. P. trifoliata and its derivative cultivars are widely used as rootstocks in citrus industry due to its strong resistance against CTV. Among three of the genetic collections belonging to trifoliate orange and its hybrid group, all of seven R genes were detected only in two accessions, P. trifoliata and P. trifoliata ‘Flying Dragon’ (Table 2 and Fig. 2). However, Citrumelo hybrid ‘Swingle’, which was derived from the genetic crossing between ‘Duncan’ grapefruit (C. paradisi) and P. trifoliata, was missing two R genes, R2 (CTV#7) and R6 (CTV#18) (Fig. 2). In order to confirm if seven R genes in a Ctv locus are intact and functional in two accessions of trifoliate orange group, we performed PCRs to amplify full length genomic sequences for each R gene from P. trifoliata and its derivative cultivar, P. trifoliata ‘Flying Dragon’ (Supplementary Table S1 and Fig. S1). The PCR amplification showed intact size of amplicon for each R gene, as predicted from the nucleotide sequences of the GenBank database (Accession No. AF506028). Korean landrace citrus is known to have resistance against environmental stresses such as low temperature, and bacterial and fungal pathogens (Kim 1988, 1991). In order to obtain the information if Korean landrace citrus has a possible resistance against CTV, we determined composition of seven R genes consisting of a Ctv locus in the 12 landraces that are classified into two groups, mandarin and non-mandarin types (Yi et al. 2018, Table 3). Four R genes including R3 (CTV#8), R4 (CTV#11), R5 (CTV#17), and R7 (CTV#21), were commonly detected in both groups, except for the absence of R3 (CTV#8) in ‘Yooza’ belonging to non-mandarin type. R1 (CTV#4) gene was detected only in two mandarin type (‘Cheongkyul’ and ‘Dongjeongkyul’) and three non-mandarin type (‘Dangyooza’, ‘Jigak’, and ‘Yooza’). Four Korean landrace citrus accessions including ‘Cheongkyul’, ‘Dongjeongkyul’, ‘Dangyooza’, and ‘Jigak’ contain three genes out of four major R genes in a Ctv locus (Table 3). CTV is one of the most deleterious pathogenic viruses threatening citrus industry worldwide. CTV resistance trait has been reported from P. trifoliata and very narrow genetic resources belonging to the genus Citrus (Yoshida 1985; Garnsey et al. 1987; Yoshida 1993; Mestre et al. 1997a). Regardless of the importance of this viral disease, robust and efficient molecular markers closely linked to CTV resistance trait have not been developed yet. In this report, we developed multiplex PCR sets specifically detecting R gene sets and performed comprehensive analysis to determine R gene composition in a Ctv locus conferring CTV resistance in the genetic resources of citrus and its relatives. Complete nucleotide sequences on the BAC clones covering a Ctv locus revealed that the genetic locus contained seven R genes encoding CC-NBS-LRR receptors, which were highly predicted to be involved in CTV resistance (Yang et al. 2003). Molecular genetics and transgenic approaches revealed that four R genes, R1 through R4, may play critical function for CTV resistance (Rai 2006; USDA patent No. 7126044). Comprehensive analysis of R gene composition in a Ctv locus from the genetic resources of citrus and its relatives revealed that whole R gene sets in the genetic locus were detected only in trifoliate orange and its derivative cultivar, further suggesting the underlying molecular mechanism of their strong resistance against CTV infection (Garnsey et al. 1987; Mestre et al. 1997a). Our result on R gene composition in a Ctv locus also further supports the critical role of R2 gene in the resistance pathway against CTV, as reported previously (USDA patent No. 7126044). Among seven R genes of a Ctv locus, R6 (CTV#18) gene was detected only in trifoliate orange and its derivative cultivar ‘Flying Dragon’ (Table 2 and Fig. 2), indicating that R6 gene also might play pivotal role in CTV resistance, although its functional role during CTV infection has not been studied yet. On the other hand, R7 (CTV#21) gene was detected in all of the accessions investigated in this study (Table 2). This result strongly suggests that R7 gene is not involved in the resistance pathway against CTV. ‘Swingle’ citrumelo is also widely used as a rootstock in several countries including Brazil (Mourão Filho et al. 2009). However, two possible key R genes conferring CTV resistance, R2 and R6, were not detected in ‘Swingle’ citrumelo (Table 2 and Fig. 2). This result indicates that this rootstock cultivar is likely much milder resistance against CTV, as compared to trifoliate orange and ‘Flying Dragon’ cultivar. Kumquat, lime, and lemon groups contained less than two genes out of four major R genes (Table 2). Especially, lemon group contains only R4 (CTV#11) out of four major R genes, suggesting that lemons are susceptible or the weakest resistance against CTV. Some of C. maxima (Burm.) Merrill belonging to the pumello group are known to have resistance against CTV infection (Yoshida 1985, 1993). Kumquat species including F. crassifolia have also been known to be resistant to CTV (Mestre et al. 1997a; Asins et al. 1999). C. maxima and its three derivative cultivars, ‘Mato Buntan’, ‘Reinking’, and ‘Siamese Pink’, contained four to five genes out of seven R genes including three major genes (Table 2). 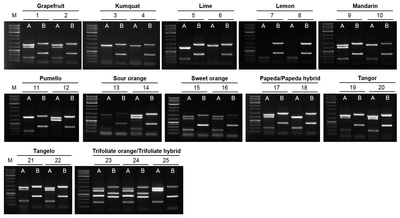 In case of kumquat, four R genes including two major genes were not detected (Table 2). Another single dominant gene (Ctv2) conferring CTV resistance, which was an independently assorting gene from Ctv, was identified from ‘Chandler’ pumello [C. maxima (Burm.) Merrill] (Fang and Roose 1999). However, C. maxima ‘Chandler’ lacked R2 (CTV#7) and R3 (CTV#8) that were key R genes in a Ctv locus (Table 2). If five accessions of C. maxima including ‘Chandler’ and two accessions of kumquat investigated in this study have some degree of resistance against CTV, their resistance could be attributable to Ctv2 locus. The genetic erosion is also one of the significant threats in citrus breeding. Ogwu et al. (2014) emphasized the importance of conserving and utilizing landraces as valuable genetic resources for modern plant breeding. Kim (1988, 1991) reported that approximately 20–30 of Korean landrace citrus had been recorded in old literatures. However, most of them are now extinct and only twelve landraces are currently conserved as germplasm collections. Korean landrace citrus has been known to be resistant to pathogens (Kim 1988, 1991). Out of twelve conserved landraces, four accessions such as ‘Cheongkyul’, ‘Dongjeongkyul’, ‘Dangyooza’, and ‘Jigak’ contained three genes out of four major R genes in a Ctv locus (Table 3). The results indicate that these four landraces are likely tolerant to CTV infection, although the resistance would be much milder than trifoliate orange and its derivative cultivar ‘Flying Dragon’. In conclusion, we developed multiplex PCR marker sets to specifically amplify seven R genes consisting of a Ctv locus, one of two CTV-resistant loci identified previously, which its sequence information was unveiled. By using the CTV marker sets, we determined composition of seven R genes consisting of a Ctv locus in a total of 155 citrus genetic resources including twelve Korean landrace citruses. Genetic composition of seven R genes was variable among the genetic resources. However, all of seven R genes were detected only in both trifoliate orange and its derivative cultivar ‘Flying Dragon’. Multiplex PCR marker sets developed in this study would be an effective molecular tool to breed scion or rootstock cultivars with strong resistance trait against CTV in citrus breeding program. The R gene marker-based genotyping results of a Ctv locus will be combined with resistance or susceptibility test of all citrus accessions against CTV in near future, which will further increase effectiveness of the marker sets established in this study. This research was supported by “Golden Seed Project (Center for Horticultural Seed Development, No. 213007-05-2-WTP11)”, Ministry of Agriculture, Food and Rural Affairs (MAFRA), Ministry of Oceans and Fisheries (MOF), Rural Development Administration (RDA) and Korea Forest Service (KFS), and “Cooperative Research Program for Agriculture Science & Technology Development (Project No. PJ01344501)”, Rural Development Administration, Korea. Authors appreciate Dr. Kyung Uk Yi for proofreading of the manuscript. Fig. 1. Development of DNA-based molecular markers specifically amplifying individual seven R genes in a Ctv locus, which confers CTV resistance (A) and establishment of multiplex PCR system consisted of two primer sets, groups A and B, which amplify 4 (R1/CTV#4, R2/CTV#7, R3/CTV#8, and R5/CTV#17) and 3 genes (R4/CTV#11, R6/CTV#18, and R7/CTV#21), respectively (B). M, 1 kb plus DNA ladder. Fig. 2. Amplification of individual seven R genes in a Ctv locus from representative cultivars belonging to 14 citrus groups. The seven R genes were amplified by multiplex PCR system consisted of 2 primer sets, groups A and B, which amplify 4 (R1/CTV#4, R2/CTV#7, R3/CTV#8, and R5/CTV#17) and 3 genes (R4/CTV#11, R6/CTV#18, and R7/CTV#21), respectively. 1: C. paradisi, 2: C. paradisi ‘Flame’, 3: F. crassifolia ‘Meiwa’, 4: Fortunella spp. ‘Puchimaru’, 5: C. latifolia, 6. C. aurantifolia ‘West Indian Lime’, 7. C. limon, 8: C. limon ‘Lisbon Lemon’, 9: C. reticulata ‘Ponkan’, 10: C. reticulata ‘Daisy’, 11: C. maxima ‘Banbeiyu’, 12: C. maxima ‘Reinking’, 13: C. sulcata, 14: C. taiwanica, 15: C. sinensis ‘Yoshida Navel’, 16: C. sinensis ‘Valencia Late’, 17: C. sphaerocarpa, 18: C. junos ‘Sibori’, 19: C. iyo ‘Ootaniiyokan’, 20: Citrus hybrid ‘Suneat’, 21: Citrus hybrid ‘Nova’, 22: Citrus hybrid ‘Lee’, 23: P. trifoliata, 24: P. trifoliata ‘Flying Dragon’, 25: Citrumelo ‘Swingle’, M: 1 kb plus DNA ladder. Primer list used in this study. R gene name designated by Yang et al. (2003). Nomenclature by consecutive numbers of total coding genes in a Ctv locus. Composition of seven R genes consisting of a Ctv locus in a total of 143 accessions including the genetic resources of citrus and its relatives. Two independent multiplex PCRs were performed for each accession. Composition of seven R genes consisting of a Ctv locus in twelve Korean landrace citruses. Two independent multiplex PCRs were performed for each accession. +: presence, −: absence. Asíns, MJ, Fernández-Ribacoba, J, Bernet, GP, Gadea, J, Cambra, M, and Gorris, MT (2012). The position of the major QTL for citrus tristeza virus resistance is conserved among Citrus grandis, C. aurantium and Poncirus trifoliata. Mol Breed. 29, 575-587. Deng, Z, Huang, S, Xiao, SY, and Gmitter, FG (1997). Development and characterization of SCAR markers linked to the citrus tristeza virus resistance gene from Poncirus trifoliata. Genome. 40, 697-704. Deng, Z, Tao, Q, Chang, YL, Huang, S, Ling, P, and Yu, C (2001a). Construction of a bacterial artificial chromosome (BAC) library for citrus and identification of BAC contigs containing resistance gene candidates. Theor Appl Genet. 102, 1177-1184. Deng, Z, Huang, S, Ling, P, Yu, C, Tao, Q, and Chen, C (2001b). Fine genetic mapping and BAC contig development for the citrus tristeza virus resistance gene locus in Poncirus trifoliata (Raf.). Mol Genet Genomics. 265, 739-747. Donkersley, P, Silva, FWS, Carvalho, CM, Al-Sadi, AM, and Elliot, SL (2018). Biological, environmental and socioeconomic threats to citrus lime production. J Plant Dis Prot. 125, 339-356. Fang, DQ, Federici, CT, and Roose, ML (1998). A high-resolution linkage map of the citrus tristeza virus resistance gene region in Poncirus trifoliata (L.) Raf. Genetics. 150, 883-890. Fang, DQ, and Roose, ML (1999). A novel gene conferring citrus tristeza virus resistance in Citrus maxima (Burm.) Merrill. HortScience. 34, 334-335. Garnsey, SM, Barrett, HC, and Hutchison, DJ (1987). Identification of citrus tristeza virus resistance in citrus relatives and its potential applications. Phytophylactica. 19, 187-192. Gmitter, FG, Xiao, SY, Huang, S, Hu, XL, Garnsey, SM, and Deng, Z (1996). A localized linkage map of the citrus tristeza virus resistance gene region. Theor Appl Genet. 92, 688-695. Kim, HB, Kim, JJ, Oh, CJ, Yun, S-H, and Song, KJ (2016). Current status and prospects of molecular marker development for systematic breeding program in citrus. J Plant Biotechnol. 43, 261-271. Kim, HY 1988. Distribution, taxonomy, horticultural characters of the local Citrus spp. in Cheju, and the genetic markers among them. PhD dissertation. Chonnam National University. Kim, HY (1991). Taxonomy and horticultural characters of the local Citrus spp. in Cheju. J Cheju Studies. 8, 59-99. Mestre, PF, Asins, MJ, Pina, JA, and Navarro, L (1997a). Efficient search for new resistant genotypes to the citrus tristeza closterovirus in the orange subfamily Aurantioideae. Theor Appl Genet. 95, 1282-1288. Mestre, PF, Asins, MJ, Pina, JA, Carbonell, EA, and Navarro, L (1997b). Molecular markers flanking citrus tristeza virus resistance gene from Poncirus trifoliata (L) Raf. Theor Appl Genet. 94, 458-464. Mourão Filho, FAA, Girardi, EA, and Couto, HTZ (2009). ‘Swingle’ citrumelo propagation by cuttings for citrus nursery tree production or inarching. Sci Hortic. 120, 207-212. Ogwu, MC, Osawaru, ME, and Ahana, CM (2014). Challenges in conserving and utilizing plant genetic resources (PGR). Int J Genet Mol Biol. 6, 16-22. Rai, M (2006). Refinement of the Citrus tristeza virus resistance gene (Ctv) positional map in Poncirus trifoliata and generation of transgenic grapefruit (Citrus paradisi) plant lines with candidate resistance genes in this region. Plant Mol Biol. 61, 399-414. Yang, ZN, Ye, XR, Choi, S, Molina, J, Moonan, F, and Wing, RA (2001). Construction of a 1.2-Mb contig including the citrus tristeza virus resistance gene locus using a bacterial artificial chromosome library of Poncirus trifoliata (L.) Raf. Genome. 44, 382-393. Yang, ZN, Ye, XR, Molina, J, Roose, ML, and Mirkov, TE (2003). Sequence analysis of a 282-kb region surrounding the citrus tristeza virus resistance gene (Ctv) locus in Poncirus trifoliata L. Raf Plant Physiol. 131, 482-492. Yi, KU, Kim, HB, and Song, KJ (2018). Karyotype diversity of Korean landrace mandarins by CMA banding pattern and rDNA loci. Sci Hortic. 228, 26-32. Yoshida, T (1985). Inheritance of susceptibility to citrus tristeza virus in trifoliate orange (Poncirus trifoliata Raf.). Bull Fruit Trees Res Sta. 12, 17-26. Yoshida, T (1993). Inheritance of immunity to citrus tristeza virus of trifoliate orange (Poncirus trifoliata) in some citrus intergeneric hybrids. Bull Fruit Trees Res Sta. 25, 33-43.